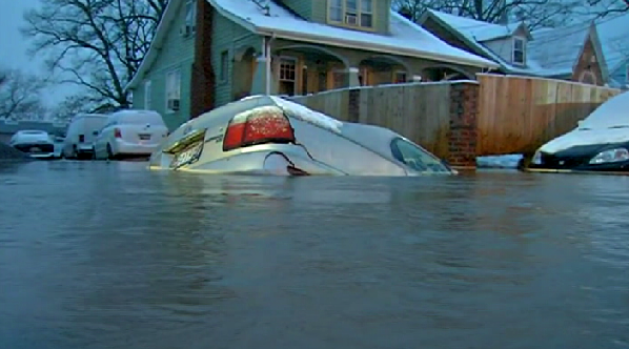 A family of five escaped their car just before it was swallowed by a sinkhole caused by a water main break in Bladensburg, Maryland, early Tuesday morning. The family of five -- parents with an infant, a 4-year-old girl and a 7-year-old boy -- had to scramble to get out in time. "There was water and then we had to get of of the car and then... the car got in the hole," the brave 7-year-old said after the experience. When he asked if he was brave, he said yes. "The water was cold," he said. Their neighbor, Luz Martinez, said of the family, "They were running to leave. Thank God they didn't put their seat belts on. It helped them get out of the car." Martinez, whose home was flooded by the water main break, said the family was inside the car when the sinkhole opened up on Edmonston Road, sending water gushing down the street. Only the car's right, rear section was visible from the hole, which was filled with gurgling water. From the back, just the right tail light and a bit of the license plate were visible. Another vehicle nearby was also falling toward the sinkhole, its nose having dipped down into the water. Martinez said the water in her own home is up to her knees in the basement. Other homes on the street were also flooded. As a mixture of rain and snow continued to fall, residents ran back and forth from one home trying to save their belongings, which were stuffed into large black trash bags. One woman, wearing shorts, appeared to be hurrying through the icy slush without shoes. 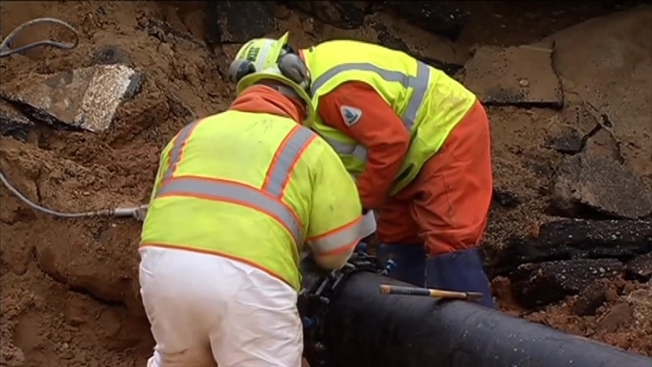 Washington Suburban Sanitary Commission (WSSC) crews needed about four hours to repair the 12-inch, 90-year-old pipe. Repairs were completed about 1 p.m. Tuesday, and both cars have been removed from the scene. The 77 customers affected by the break have had water service restored. As of 1:30 p.m. Tuesday, Edmonston Road remained closed between Decatur Street and Chesapeake Road while crews worked to repair the street.